The only resort in North West Region of the country to be built on a Private Island of 40 acres. Jaisamand Lake and the Sanctuary are rich in fauna with counts of over 300 bird species. Jaisamand Island Resort is an island resort and it’s the only one on the entire 40 acres island in Jaisamand Lake. The lake has a total number of 3 islands measuring from 10 to 40 acres. The Jaisamand Lake Dam is 300 Meters long and is a part of the Heritage Monuments of India. The dam also has the Hawa Mahal Palace, winter Capital of the erstwhile Maharana’s of Mewar. Jaisamand Island Resort is on a 40 acres Island covered by water and lush green Babool Jungle. The 43 rooms and suites offer the utmost privacy and an intimate bird watching experience with breathless views of lake from all rooms. For the Jaisamand wildlife sanctuary, we also organize extended trips from Resort, journey on jeeps to old hunting lodge. The resort offers all modern amenities that are required by a luxury guest. Conference Hall, Parking, Disabled Facilities, Arcade/Game Room, Laundry Facilities, Recreation, Security Guard, Doorman, Elevator/Lift, Complimentary Newspapers in Lobby. Desk, Reading Lamps, Basic Bathroom Amenities, Internet Access, Refrigerator Room, Bottled Water in Room, Wakeup Calls, Complimentary Newspaper, Child Care, Safe Deposit Locker Facility. Breakfast Services, Business Facilities, Conference Hall, Doctor on Call, Laundry Facilities, Parking, Restaurant, Room Service, Bar. 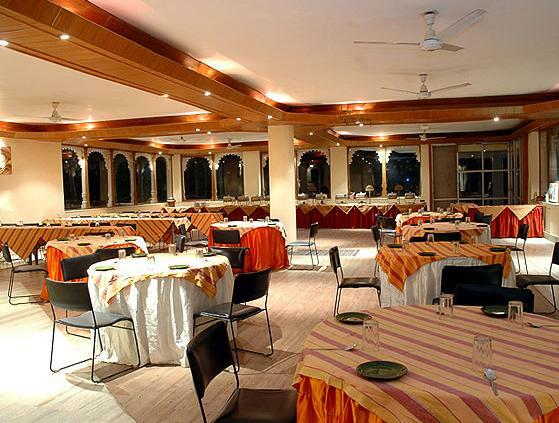 User reviews for "Jaisamand Island Resort Udaipur"